Don’t worry. If that’s you, you’re not alone. Back when I first started Sunnystorm Marketing, branding was a mystery to me, too. I kind of knew about color palettes and I vaguely knew what a personal brand was, but honestly I didn’t realize how important it all was. Now, several years later, I am so thankful that I came to my senses and took both my VISUAL brand and my PERSONAL brand seriously, early on. They have helped me to build up my business, grow a name for myself, create a consistent visual identity that I love, and create actual MONETARY VALUE for my brand. Like, my brand Stephanie Mitchell and my brand Sunnystorm Marketing have a dollar value. Your brand is a combination of the ways you express what makes you unique and valuable. You can do this through personal branding (being the face of your business) and through visual branding (how you visually represent your business, especially online). One of the best ways to express what makes your salon unique, and to build your brand, is on your website. 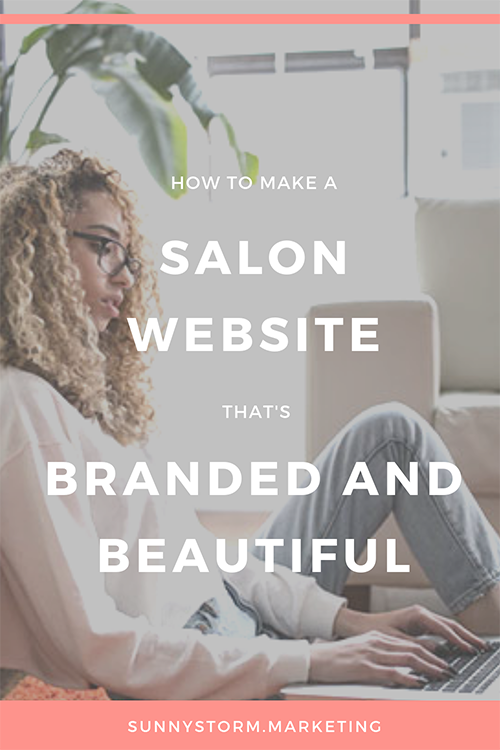 In this blog post, I’ll show you four easy ways to make your salon website beautiful and branded - through colors, fonts, photography, and personal branding. Your website is the face of your beauty business, and it deserves all the love and attention you have. 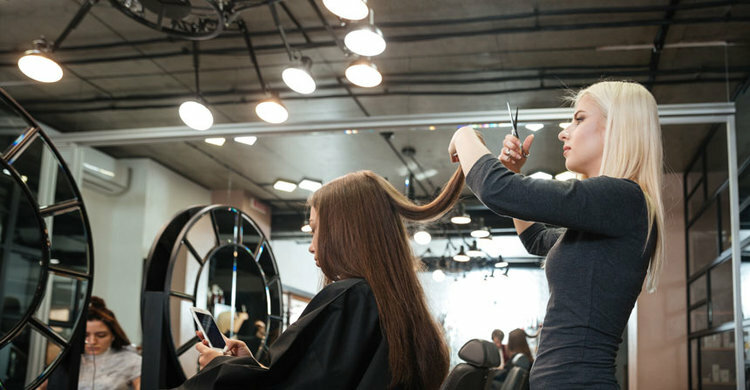 Your salon’s website is the face of your business. Whether you like it or not, it’s usually among the first places that potential customers start at when researching a business. Think of the last time you researched a new restaurant, a gym, an accountant, or a fellow beauty professional online. What did you do? You probably popped their name in Google, glanced at their reviews on Google, possible clicked through to their Instagram to learn more, and then… you probably went to their website! Why check out a business’ website if all the basic info is right there on Google and Instagram? People want to know these things, and they visit your website to find out. So, what is your website actually telling your visitors? When was the last time you checked your website and pretended to be a potential client? It might be worth asking a staff member, friend, family member to look at your website and give their thoughts. What is their overall impression of your site? Is it easy to use, professional, beautiful, and does it shine the best light on your business? Websites are getting really easy to make with apps and templates, which is great, but often that means that websites are thrown up and forgotten about. Worse, they often have a standard template with no personalization, no branding, and they make your salon anonymous and hard to relate to. Your website needs to branded so that people start to get familiar with your colors, fonts, and designs. If they see you elsewhere one they will remember you based on your brand. Having a branded website also attracts the right people to your business and gives them the feeling that “this business is for me!" Finally, branding is about making your website personal. You want to make it your own while including photos of you, your salon, your work, and details about what makes you unique. I’ve mentioned “professionalism” a few times so far. A huge part of having a professional, polished website is making it branded - which we’ll get to in a second. But it’s also essential for your website to have a few things in place on order to attract people to it, and do a good job of converting them to clients. It has a clear call to action to book an appointment at the very beginning. This means that without scrolling down at all, near the top of your website you need a button or link to book an appointment. You’ve done some basic SEO optimization. For ideas to improve your website’s Google ranking, read my blog post here. You collect email addresses somewhere. What better way to keep in touch with potential clients? If you want to get inspired with some of the top salon websites I’ve found, check out my blog post about building the perfect website here. ﻿ And below you can download my checklist to make sure your website is SEO-optimized to get found on Google! Okay, now that you’ve done that, it’s time to get to work with branding. 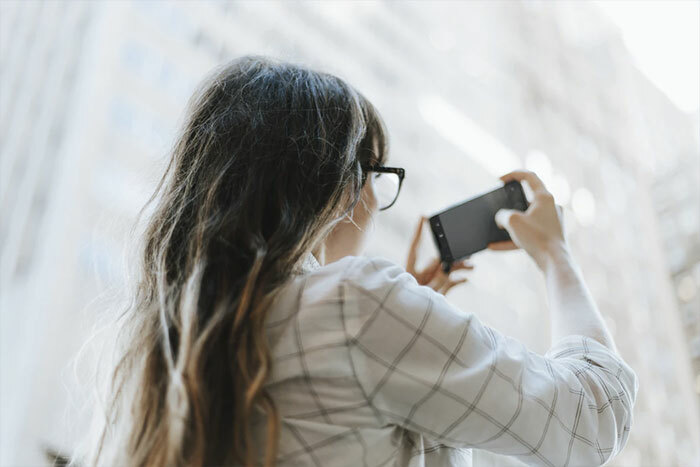 Getting high-quality photos of your staff, your portfolio of work, inside your salon, and more is going to make SUCH a different to your marketing. Having original photos that you took yourself gives a feeling of genuineness and trustworthiness to your website. When you rely on stock photos (photos you paid for/downloaded) for your site, it looks like a random, anonymous website that was made from a template. Stock photos make people wonder “If they’re a real, honest business, why can’t they just use photos of their own work?”. When you realize that your website visitors are often on there JUST TO SEE PHOTOS OF YOU AND YOUR WORK, you’ll probably wake up and replace all your stock photos. And in case you’re wondering… YES, everyone knows whether they are stock photos or the genuine thing. So don’t try to fool people! I do understand why so many salons rely on stock photography: it’s hard to make your own photos look THAT good. Stock photos just look so bright, clear, and professional. Fortunately, it’s not actually that hard to take your own high-quality salon photos. Click here to read my blog post all about setting up a DIY salon photo studio. Which photos should I use on my website? If you know these three things, it’s easy to choose which photos to use on your website. They should either share your personal brand, your work (hair, nails, skin, etc), or reinforce your visual brand. And before I go any further, if you’re stuck about what exactly your salon’s “Visual Brand” is - I’ve got something for you. Click here to learn how to make a mood board/branding board for your business. Below are some examples of photos to use on your website, with examples and ideas to make them look amazing. I put this one first, because it is seriously the most important part! You should have a photo of yourself or your staff on the front page of your website. Everyone is most curious about the “who” behind a business, and a picture says a thousand words. Make sure that the photo is high quality (not grainy) and bright, and that it’s a natural pose - smile like you normally would. I recommend you put more than one photo of yourself on your website, so you can have one on your homepage, one on your “about” page, and one on your “clients” page - a photo of you with a client. This one seems so obvious, but I can’t believe how many salon websites I’ve visited where the gallery page or menu page is full of stock photos. No, girl! Instead, spend some time and effort taking regular high-quality photos of your work (learn how to take great photos here). While I don’t recommend that you include every single photo ever of your work, I do recommend that you pick out your favourite, high-quality photos (between 10-20 should be fine). Your visual brand is made up of your logo, your color palette, font palette, and image/design style. By using their brand colors in their photos, and using a consistent photo style, their website looks professional and polished. First of all, make sure all your photos are bright, clear, and high-definition. Try doing some light editing in your photos to add a subtle filter and crop out details you don’t want. Okay! Now that we've worked on your photos, lets move onto more ways to brand your website! Your color palette is a huge part of your salon brand, and it is SO important to make those colors reflected on your website. If you don’t have a firm color palette yet that you’re using consistently, don’t worry! I show you how to choose the perfect color palette here. Once you’ve chosen your colors, it’s time to splash them around on your website to make an amazing first impression! Once your website visitors see your colors represented on your site, they will start to associate those hues with you. Then, when they see you on social media, email, advertising, or your logo in-person, they will remember you based on that. I hope these ideas are inspiring you to freshen up your website with your brand colors! Next we’ll look at how to do the same thing with your fonts. Fonts are such an important but under-utilized way to brand your business. In case you weren’t sure, your fonts are the type of writing you have. Different ways of writing have such different personalities. Even if you’re using the same words, fonts give personality to what you say, and you want to make sure that the fonts on your website are saying the right thing about your business. So, the first step is to choose a heading font, subheading font, and paragraph font as part of your brand. You can learn how to do that in this blog post here. Once you’ve done that, use your website editor (whether it’s Wordpress, Wix, Squarespace, or Weebly) to change your fonts. 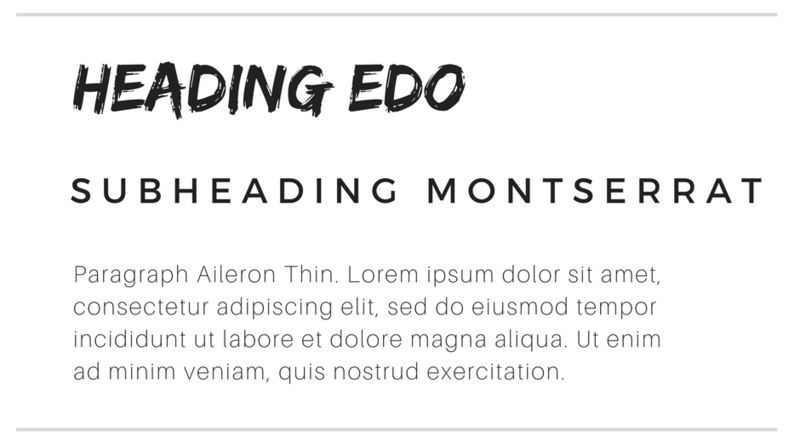 Do not use more than 3 fonts on your website, and always keep your heading, subheading, and paragraph fonts consistent. This will make your website look more customized, professional, and beautiful. Now that you’ve updated your website with your colors, photos, and fonts - be sure to use all of these consistently in your branding, even outside of your website! A brand is something that expands to everything you do, and the more often you use it, the stronger it gets. Think about how Tiffany’s Robin’s Egg Blue has become associated with their business. This only happened because they continued to use it consistently for more than 150 years! The last part of making a beautiful and branded website is to make it your own, and use it to express your personal brand. A personal brand is no longer just reserved for celebrities, authors, and sports stars! Yes, even hairdressers, spray tanners, nail techs, salon owners, and estheticians need a personal brand. 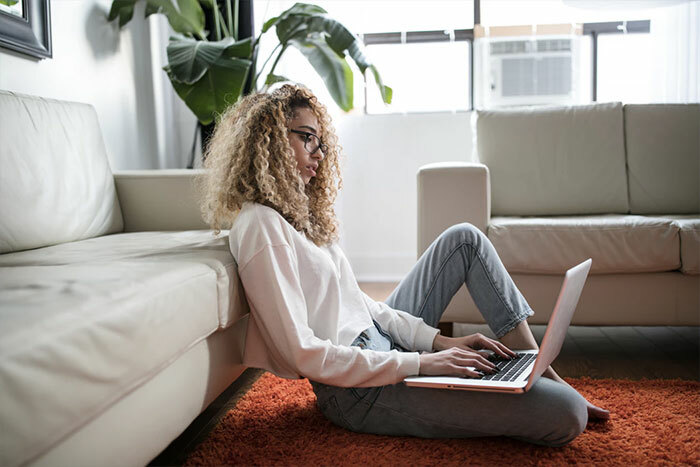 Your personal brand needs to come through on your salon website. You need to include photos of yourself, info about who you are, your opinions and values, and you also need to use it as a space to educate and inspire related to your beauty niche. And by the way, if you’re not sure what your personal brand is just yet, I have the perfect blog post for you: Personal branding 101 for beauty professionals. As I mentioned earlier, it’s very important to include lots of photos of you and your staff, if you have them, to help people create a connection with you as a person instead of as a business. Which has more personality? Which is written in a friendly, approachable way? Don’t make your writing dry and boring. Write from the heart and put your personality into it. Finally, a huge part of your personal brand is being a leader, an educator, and an inspiration. I know it may seem strange, but your clients really do look up to you as a professional and as someone who’s on the leading edge for beauty, style, hair, nails etc. One of the best ways of promoting your personal brand on your website is through educational content. Including a blog is a great way to do this. Try to write at least one blog post per month about a style trend, answering commonly asked questions about beauty, a tutorial related to your services, or anything else. If you want ideas for what to blog post, check out this guide with 10 fantastic ideas for salon blogging. Your salon’s website should not just be a random, anonymous, template-looking site that you ignore. It definitely doesn’t get ignored by your potential clients! They click on it every single day from Google and from your social media to learn more about you - so be sure that it does your business justice! By creating a website that is bursting with your visual brand, it makes your salon look so professional, and it helps people get familiar with your business personality and style. Your website also needs to be expressive of your personal brand. It needs photos of you, information about who you are and why you’re different, and it needs to be as unique as you are. I hope this blog post has given you a clear idea of how to refresh your website, and make it beautiful and branded! And once you’re finished with designing your site, you want to make sure that you get found on Google! Below you can download my checklist of 24 things that will improve your salon’s search ranking online. Enjoy!